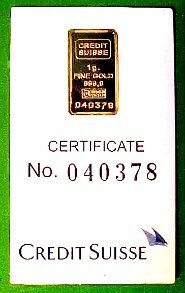 For nearly forty years Valcambi SA has been the only manufacturer of Credit Suisse bullion bars. Valcambi SA, is one of the world's largest manufacturers of bullion bars and minted ingots. Valcambi is credited with producing the world's first one ounce minted ingot. The Credit Suisse Group AG is a Swiss multi-national financial services company headquartered in Zurich, Switzerland. Credit Suisse was founded by Alfred Escher in 1856 under the name Schweizerische Kreditanstalt (Swiss Credit Institution). The bank is organized into three divisions, Investment Banking, Private Banking, and Asset Management. In 1988, Credit Suisse gained a controlling stake in The First Boston Corporation, hence the longtime name of its investment banking unit Credit Suisse, First Boston. Refining operations at Valcambi began in 1961, in 1967 Credit Suisse purchased 80% of the Valcambi. In 1980 Credit Suisse purchased the remaining 20% of Valcambi and the refinery became a 100%-owned subsidiary of the bank. Then in 2003, a European Gold Refineries Holding SA was formed by the founding members of Valcambi and Newmont Mining Corporation, purchased 100% of Valcambi. 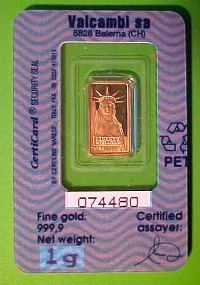 Credit Suisse's bullion is one of the most popular, easy to carry, store and convert into cash in the world. The bullion is fully backed by the Credit Suisse Bank of Switzerland. Credit Suisse bullion bars and ingots come in sizes from 1 gram to a troy kilo (32.13 oz / 2.2lbs) The purity of their bullion bars range from .9999 gold, .999 silver and .9995 palladium and platinum. 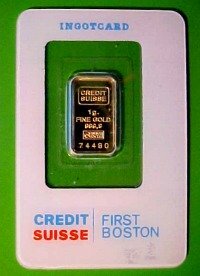 Most Credit Suisse bars are encased inside an assay card or certificate with its exact purity, weight, serial number and signature of the assayer stamped and sealed on it for safety and security.